Please may I say what a pleasure it was to have your pupils with us at Kendal Snowsports Club as part of their visit to Tower Wood Outdoor Centre. The children were all extremely polite, cheerful and very hard working. They are all wonderful ambassadors for your school. Please pass our thanks and best wishes to all the pupils and staff who visited us. Thank you once again for Friday evening at the Marine Hall. Everyone, without exception, has spoken warmly about the school children, in fact some have said it's been the best Songs of Praise ever. 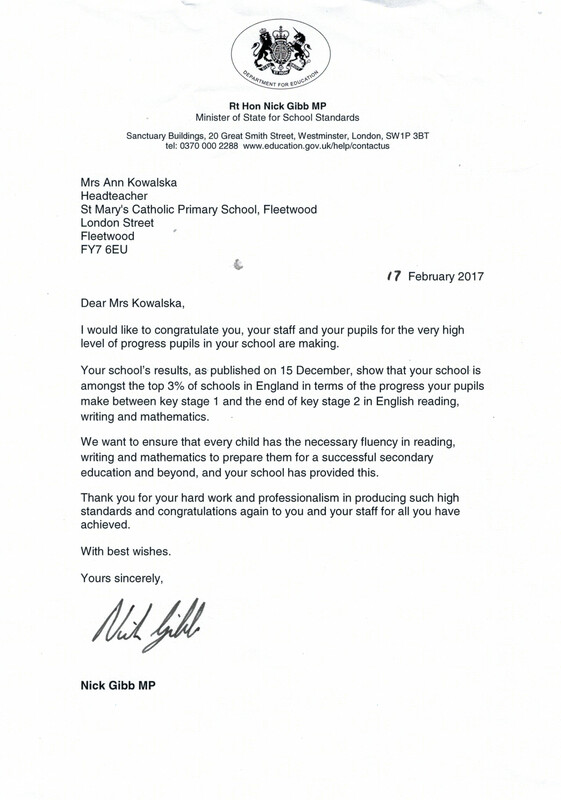 So would you thank the children and staff on my behalf. On Friday 9th October I had the privilege of attending the 'Fleetwood Churches Together' event at the Marine Hall in Fleetwood. Would you please pass on my sincere thanks to all your staff and the children for an absolutely brilliant evening. Your pupils were a credit to you, your school, and most importantly to themselves. 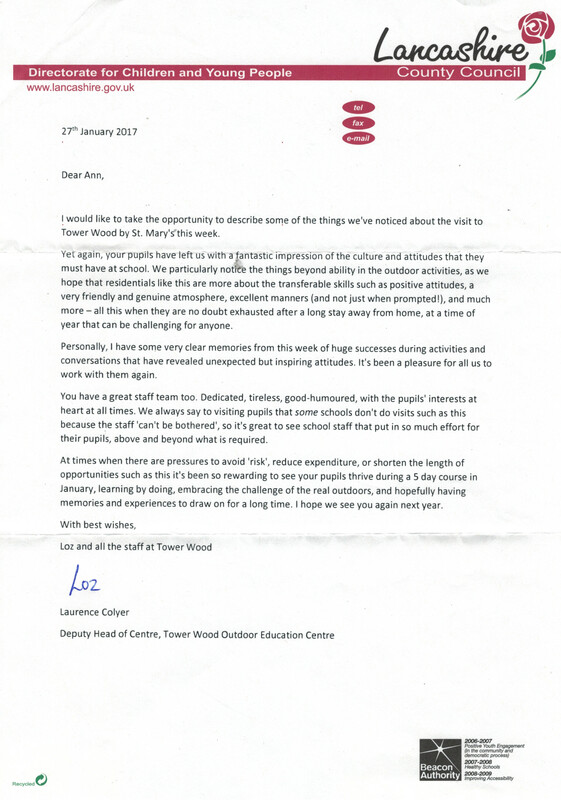 The staff and pupils from St Mary's undertook an outdoor activity residential course at Tower Wood Outdoor Education Centre from 19th to 23rd January 2015. It became obvious to the staff at Tower Wood that there was considerable interest in the Centre's Facebook page, as we often publish a photo album from courses such as this and include a brief description of the course. The degree of engagement by the parents of the pupils attending the course was unprecedented. It is my guess that every pupil's family (parents, grandparents and more) showed regular and keen interest in their child's time away from home on this educational visit. We are aware that it can be a difficult time for some, when parents and pupils are apart for several days, often for the first time. We try however to discourage contact by phone as this can often make issues such as homesickness worse, break the 'magic spell' of a child's residential experience and the independence it offers, and detract from the opportunities and lifelong learning of the experience. What was evident though, was the level to which all parents showed care and concern for their children, wishing them well, recognising the developmental possibilities of the activities such as skiing ("Fantastic! Olympics here we come! "), giving us the chance to encourage that inspiration with the idea that this could well be possible. It was also obvious that they missed them dearly but managed to refrain from asking to speak to loved ones whilst they were away. It is so encouraging to us that so may parents showed a great attitude to this residential, and it can't go without mention that this was certainly matched by the staff and pupils themselves. Anyone who has spent 5 days in the mountains, forests and lakes of the Lake District in the snow in January, aged 10, will appreciate how significant this really is. We hope that the value of this educational experience - educational in the wider sense - is recognised beyond the school as much as it is within it.